Appreciation - What Does It Mean? What does the term "appreciation" mean? What is meant by appreciation? 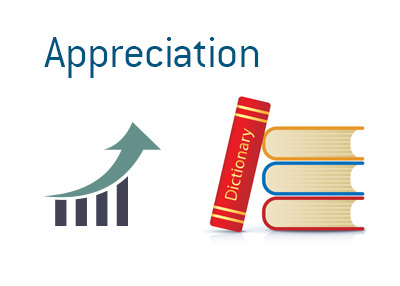 "Appreciation" occurs when an asset increases in value. The opposite of "appreciation" is "depreciation". For instance, let's say that you buy a house for $300,000. After two years, the house is valued at $400,000 thanks to a very strong real estate market in your area. In this case, your home has "appreciated" in value by $100,000 - truly a shrewd investment. Or, in another instance, you decide to purchase 100 shares of Microsoft at $40/share. After two particularly strong earnings reports in a row, shares of Microsoft now trade at $50 per share. In this case, your investment has appreciated in value by $1,000 (100 shares * $10 per share).